For the Chicago Food Swap this month, I made buffa-faux chicken dip, tamales, salsa verde, and rumchata (all vegan) for Chicago Food Swap @ The Chopping Block in the Merchandise Mart. 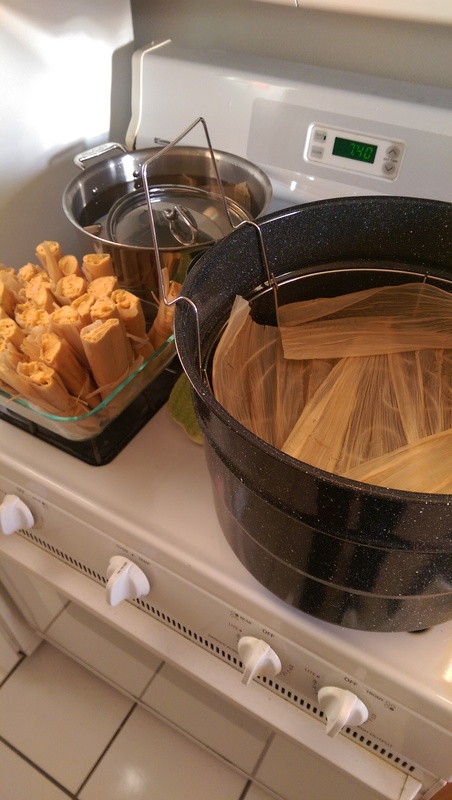 New food swapper tip for anyone internetting first time food swap what to do or what to make: Do not make tamales by yourself for a swap, unless you make them a few days before hand and then freeze them. There are times I learn a new skill and I want to practice and/or show off. I had learned how to make vegan tamales at Kimmi’s the week before and decided for sure that I wanted to make them for the food swap a week later. Originally, I purchased salsa verde to pour over the soy curls (soy chicken) I had soaked, trying to replicate Quesadilla la reina del sur’s delicious salsa verde tamales, but I decided that was not authentic enough and that I had to make my own salsa verde as well (for the first time). Hello, run-on sentence! So, instead of making three items, I was making four items in two days. In times the pressure is on in my work life, I go into ultra-achiever mode and do things like this in my free time. You know. For fun! I swapped for some fantastic things this time. There were not as many vegan treats as I had hoped, but plenty of vegetarian goodies. 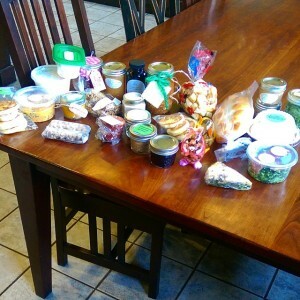 Lots of bready things & jams/chutneys to go with them this swap. I had lunches for over half a week from my haul and many freezable or pantry items, which are always appreciated. The swappers are such a great group of people and I am happy to be a part of it. I hope to take my MIL Gail to the May one since she and Wes will be in town. If so, I vow to make things ahead of time for that one! Chiditarod attending/adventuring & Furious Spoon with Shanleys & Brian. 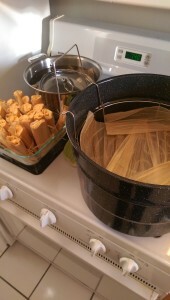 Vegan tamale making/cookie baking with Kimmi & friends. Quesadilla with Erin R. & Alison S./waffles at L&Z’s. Takito with work buds. Dinner with Gretchen @ Bullhead Cantina. Promo item tradeshow in Arlington Heights. Saw Eliza perform at Harold Washington Library! Breakfast with Z, LCB, & Amy @ Grandma J’s Kitchen. Dragonlady vegan buffet with Sue cooking again! Made buffa-faux chicken dip, soy chicken tamales, salsa verde, and rumchat-ahh (all vegan) for Chicago Food Swap @ The Chopping Block in the Merchandise Mart. 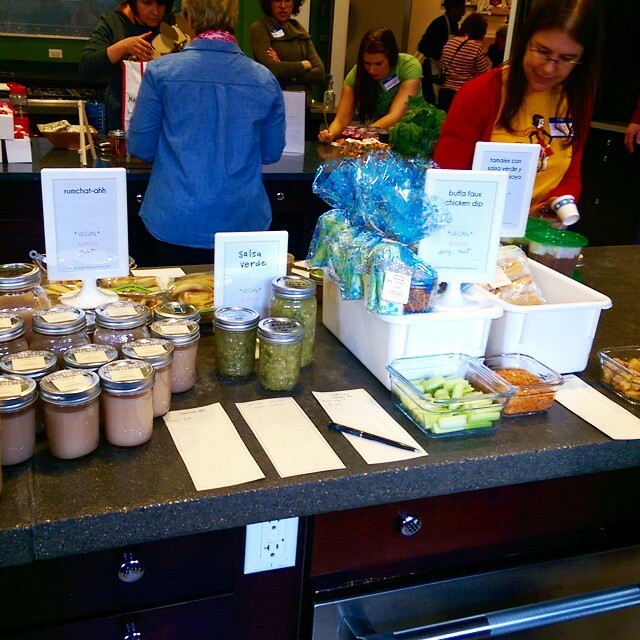 Chicago Food Swap @ Chopping Block. Filed taxes! Walked to Green Grocer because it was glorious outside! Dragonlady with Alison & Jen L. Baked cupcakes for a coworker with vanilla & blood orange frosting. Bob’s Burgers @ Chicago Theatre. Dropped off stuff I sold on West Town Community Swap & Sell. Updated Rhymes with Twee stock at Local Goods. Movie with my boo. Lunch @ Rice/movie with Jerroid. Jen L. bday @ Archie’s. Etsy orders picking back up again after the usual beginning of the year lull that happens for me. Lunch with Gretchen @ Breakfast House. Miss Spoken @ Gallery Cabaret. Made food for Kristen & Bill. Dinner @ Quesadilla with Z. Dinner with Stacy @ Sushi Para II. I did not prepare myself to think much of Whiplash, but it was a truly GREAT film; one that made me audibly gasp and I have thought about it many times since, though I don’t want to watch it again. I played alto saxophone at school for 6 years, through my senior year of high school. I was dedicated and good, fluctuating back and forth between 1st and 2nd chair, playing in symphonic, marching, jazz, and even pit sometimes. 100% band nerd and proud of it, yet I never got to this level of obsession. I saw it around me, but very few people from our (very good) marching & symphonic bands chose to continue this life after high school. I greatly respect professional musicians and one of my dearest friends, Eliza, has chosen this life and I admire her greatly for it. My preference is a day job with regular hours and stability so I can work on Rhymes with Twee goods by night. Anyways, you should see this film, people of the internet, if you have not already done so. Other particularly great films this month were: Alien & The Never Ending Story (duh), Non-Stop (spoiler alert: still waiting for one of these films where Liam Neeson actually *IS* the bad guy).